Nash Motors of Canada, Limited was organized in 1939 as the sales and service arm of Nash-Kelvinator. The new Canadian headquarters was located in Windsor, Ontario, just a stone's throw away from the company's world headquarters in Motor City but on the south side of the Detroit River. Prior to 1939, regional distributors had handled importation and sales throughout the Dominion. 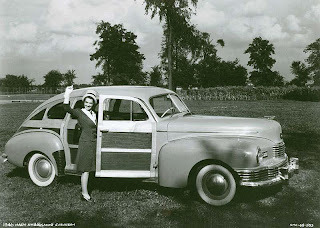 1946 Nash Ambassador Suburban featured generous wood trim. After World War Two, Ottawa announced it would shut out automobile manufacturers who didn’t assemble cars in this country. Nash, understanding the importance of doing business in Canada and the British Empire, invested $1.4 million in 1946 on a mothballed Ford plant in Toronto. Located at the corner of The Danforth and Victoria Park Road, the property was situated at the extreme eastern end of the city, at the end of the Luttrell Loop tramline. Beyond the factory's windows, there were only fields and farms. Unstable international currency fluctuations prevented Nash from opening up shop until April of 1950. When the plant did open there was plenty of hoop-la; the Canadian Statesman was the first model built. A total of 1,150 units rolled merrily out the factory doors during the very short model year. 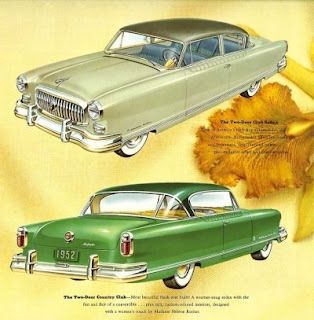 The 1951 Nash cars began to scoot off the lines in September of 1950 and the company was most pleased with the total of 3,808 units built during that model year. 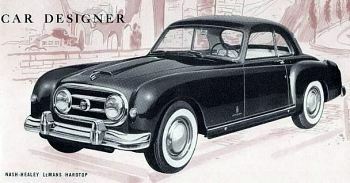 Nash marked its Golden Jubilee in 1952 but the domestic production story gave no reason to celebrate. The conflict in Korea and a prolonged steel strike held production of the divine fiftieth-anniversary cars to a disappointing 1,612 units for the model year. 1952 marked Nash Motors' Golden Anniversary. 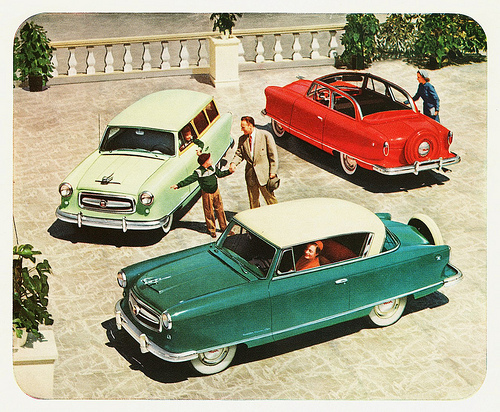 In June of 1952, company officials announced that the trendy Nash Canadian Rambler compact would be added to the 1953 production schedule. Once again, startup was delayed because of the police action in Korea. It was only in December that cars started to trickle down the assembly lines. 1953 Nash Rambler was pleasantly restyled. The first Nash Canadian Rambler was completed on March 10, 1953. The stylish, upscale compact sold for $2,460. With war behind them and materiel restrictions relaxed, a total of 3,038 Nash cars was chalked up for the 1953 model year. Of that number--863--or nearly one fourth of the vehicles assembled were the compact Canadian Ramblers. A survey revealed that the Nash Rambler was most often the second car in a majority of consumers' stable--the other ride being the prestigious Cadillac. Workers turned out a total of 3,778 Nash cars for the calendar year. Production of the 1954 models got underway on October 2, 1953. Mercifully, the conflict in Korea had ended in a United Nations-brokered truce but materiel--particularly steel--was still in frustratingly short supply. Labour unrest was another problem. Completed cars sat waiting for parts as simple as door handles. Once again the line's launch was delayed. This time, there wasn’t a sufficient supply of automobiles to ship to dealers until December. The 1954 Nash Rambler Club Sedan could be ordered with air conditioning. Frantic dealers, desperate to stay solvent, finally introduced the 1954 Nash line on December 4. As promised, the two-door Nash Canadian Rambler Club Sedan had been added to the lineup. Parliament unexpectedly tightened credit regulations to curb inflation. Unfortunately, the correction translated into an overabundance of unsaleable cars. The Nash plant was closed on December 9 in an attempt to correct the inventory imbalance. The doors stayed closed for forty-one long days. Instrument panel stressed beauty and safety, two longtime hallmarks of Nash. It was virtually impossible to sell cars in the inhospitable credit climate but dealers for every manufacturer bravely flogged cars a best they could while execs lobbied in Ottawa to change the rules before the auto industry was destroyed. 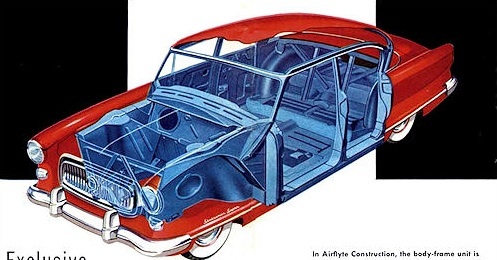 Nash advertising billed its product line as “the cars with a ‘double life time’ and ‘Your safest investment today…your soundest re-sale value tomorrow.’” The snazzy Pinin Farina styling and comfort were highlighted in Canadian advertising while technical and engineering features such as the advanced unit-body construction were minimized, although Nash did brag that Airflyte Construction had proved its superiority in 45 billion miles (72,420,480,000 kilometres) of road testing by owners in the past thirteen years. Salesmen were instructed to tell customers that Nash was the way to “enjoy a whole new way of life on wheels.” Interiors were not merely designed, they were now appointed by no less of a goddess than THE Madame Hélène Rothier, famed Parisian interior decorator. 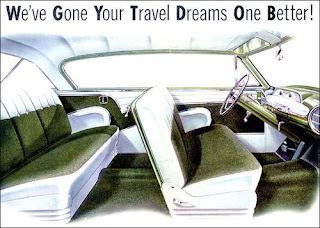 The vast, foam-cushioned Airliner seats turned the car's interior into “your own private sleeping car” and driving amounted to “easy-chair motoring.” If that wasn't strong enough to get the message across, a “luxurious limousine ride” was promised. Nash could proudly boast the largest windshield and rear window in the industry. The cavernous trunk could "hold an outboard motor" and when it didn’t, it promised to “swallow up” huge amounts of luggage. The 1954 Nash Ambassador Custom offered thrift in a full-sized car. The Ambassador Custom was modestly appointed, yet it came with the continental tire mount as standard equipment along with an electric clock, a map light, turn signals, chrome wheel covers and a safety-inspired vinyl-covered rubber crash pad crowned the instrument panel. The luxurious, top-of-the-line Nash Custom Country Club hardtop featured a “specially tailored interior” but one could upgrade that to a most opulent cabin upholstered in genuine leather and fine needlepoint . 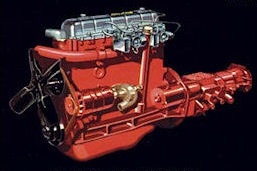 The 130-horsepower, six-cylinder Super Jetfire engine was standard equipment. The LeMans Dual Jetfire engine was highly respected on European race tracks. Nash owners could decorate their already luxurious Ambassadors with the mighty, race-proven 170-horsepower LeMans Dual Jetfire engine, power steering, power brakes, electric Power-Life windows, the Weather Eye Conditioned Air System, the Airline reclining seats and Twin Travel Beds, the Dual-Range Hydra-Matic transmission or Automatic Overdrive, the Duo-Coustic radio that offered concert-quality listening clarity, white sidewall tires, seductive retro-look wire wheel covers, Solex tinted glass and a stunning chrome hood ornament designed by George Petty. Mattresses and slip-on insect screens were available at a “small extra cost.” Air conditioning became a new option in the spring of '54. Thrifty owners saved Metric tonnes of money when travelling as seats lay flat to become Twin Travel Beds in roadside Nash Hiltons. 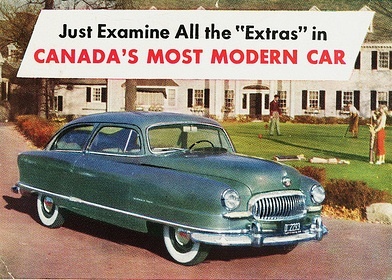 The lesser-priced domestically-built Canadian Statesman four-door sedan and its imported Statesman two-door sibling were a wee but more modest with their 110-horsepower Dual Powerflyte engine. Custom models were nearly as well equipped as the Ambassadors, right down to the elegant Continental tire mount. The options list was almost as long as that of Ambassador, too. 1954 Nash Rambler four-door sedan. It tipped the scales at 1 195 kilos (2,630 pounds). More big news in the Rambler family was the promise of assembly of the four-door sedan on the stretched 2 743-millimetre (108-inch) wheelbase. The Canadian Rambler Custom Sedan was equipped with the famed Weather Eye heater, a radio, a custom steering wheel, turn signals, electric clock and full wheel covers, all calculated into the base price. The Rambler was powered with the tried-and-true Flying Scot, 90-horsepower engine, first introduced in 1941. The less expensive Super models still came with a heater and radio as standard equipment. The options list was as long as the bigger Nash cars. Airliner seats that turned into beds were an extra-cost option on Ramblers. The Nash Rambler instrument panel was classy and functional. The factory finally re-opened on February 8th and all 334 employees returned to work. Sales were stimulated Canada-wide as the Nash shaved anywhere from $34 to $235 off the prices of all Ramblers and Statesman models on February 10th. The plant hummed happily until March 11th when a ferocious blizzard shut down all of southern Ontario. The long-awaited four-door Rambler sedan was added to the mix the day after the storm. It was sold as the Nash Canadian Rambler Super. 1954 Nash Metropolitan bowed to the Canadian public on March 19th. The sensational subcompact Metropolitan, imported from the UK, bowed on March 19th, brought unprecedented foot traffic into Nash dealerships. The initial order for the Canadian market was only 172 of the little cuties. Dealers promptly sold out of Mets. They were back ordered until a second, eagerly awaited shipment finally arrived on June 21st. The bite-sized Metropolitan was as cute as it was tiny. The captive import came dressed to the nines with leather-trimmed, smartly-styled nylon upholstery, a radio, heater and turn signals as standard equipment. With its 42-horsepower, four-cylinder engine, it promised to deliver up to 72 kilometres (45 miles) to 4.5-litres (one Imperial gallon) of gasoline. The 1954 Nash-Healey coupe was designed by Pinin Farina. If Nash wasn’t generating enough excitement with its innovative product line, the company merged with Hudson on May 1, bringing 251 Hudson dealers into the new combined family. American Motors Canada Limited was the largest merger the business world had ever seen. Hudson promptly shut down its operations in Tilbury, Ontario in August and moved into the Nash plant during the Civic Holiday weekend. A new national sales office opened on The Queensway in Toronto. On June 21st, output in the Nash plant was cut from twelve to six cars a day in a bid to keep employees working. Holiday time and annual model year changeover closed the plant on July 26th. It did not open again until December and then, only 64 of the 1955 models were built before year’s end. 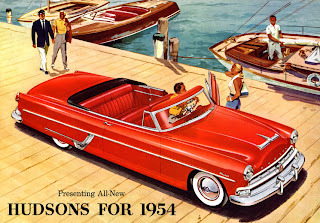 Surprisingly, the 1954 Nash cars enjoyed their highest market penetration in New Brunswick. Nova Scotia, Prince Edward Island and Newfoundland. Always marching to the beat of a different drummer, folks in the Atlantic Provinces were far and away the most fertile ground for Nash products. Domestic production for Nash in 1954 consisted of 1,400 Statesman four-door sedans, 326 Canadian Rambler Club (two-door) sedans and 395 Rambler four-door sedans. The model year ended on August 6, 1954--finishing with a disappointing 2,321 units. Canadian Automotive Trade reported sales of 2,383 Nash cars during the calendar year. New car registrations showed 2,370 new Nash passenger cars were plated during the calendar year. That figure did not include sales or registrations of Nash cars to federal, provincial or municipal governments, however. Nash might be at the bottom of the domestic assembly barrel but not for long. The only way was up and Nash was about to make the most phenomenal rise ever witnessed in domestic automotive history.